This is an aside, but can we please stop using the terms “third-world” and “global south” to describe developing countries? I know that this is inconsequential, but terminology shapes the worldviews that it is used to articulate, and using terms that are fundamentally meaningless breeds both sloppy thinking and unsound narratives. The term “third world” is a product of the Cold War — it described countries that we not aligned with either NATO (the “first world”) or the USSR (supposedly “second world”, but this term was almost never used). For the last 20 years the term “third world” has been by definition meaningless, but it’s remained in common usage in spite of its irrelevance. “Global south” isn’t much better. Yes, most of the world’s poorer countries are generally southerly located, and historically rich countries tend to be located high in the northern hemisphere. But there are so many exceptions to this broad distribution that it’s almost meaningless. There are many rich countries outside of the northern hemisphere — Chile, Australia, and Singapore all spring to mind — and there are still European countries with standards of living much closer to poorer parts of the world than their more fortunate European peers. Given the world economy’s ongoing shift from the Atlantic to the Pacific, framing world income and economic development in North/South terms seems even more archaic. I understand the enduring human enthusiasm for sorting to world into neat and easily understood groupings, but in these cases they’re so blatantly uninformative that I can’t see their value. Base image by Wikimedia user cflm, modified by author. OECD countries are depicted in blue. 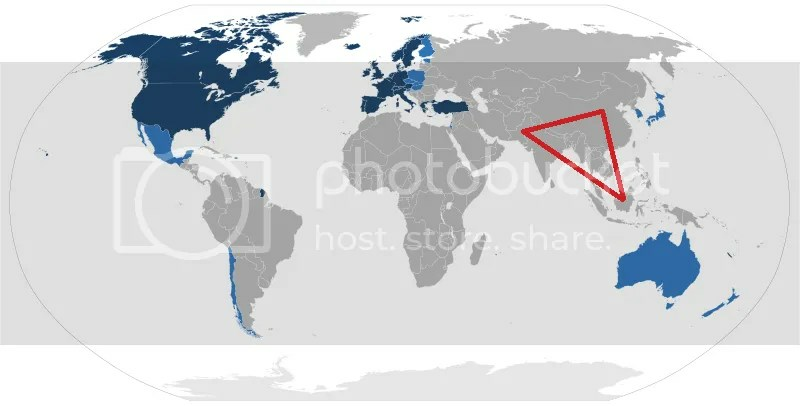 However, over one half of all of humanity lives within the red triangle. It’s worth remembering that despite the common Western view that depicts North America and Europe as the central drivers of world history, the experience of what’s historically been the “rich” world is generally peripheral to the shared experience of humanity in general: North America is only home to 8% of humanity, and Europe 11%. This trend is increasing due to historically faster population growth in poorer countries — interestingly, in the span of the 20th century Europe’s share of the human population has fallen from 25% to its current 11%. The center of the world’s economy 21st century shift towards the center of the human population is encouraging and should be celebrated, and the fact that the economic map of last 500 years of human history was nearly the inverse of humanity’s distribution on the globe was a profound injustice. With its passing geographic sortings of human income should become less relevant. Update: Of course, I’m going to keep using the term “the West” because it makes me feel like I’m in Lord of the Rings. Any suggestions for a replacement then? “Developing” isn’t quite the right word, especially since many developing countries are going backwards. “Poor” would be too honest and also yet less truthful, since many of these countries have great wealth, just concentrated into the hands of kleptocrats. I just can’t get excited about terminology squabbles because any label will tell less than the full story and introducing new terminology usually adds to the confusion. Also, considering this “profound injustice” jumpstarted the Renaissance of human learning, science, and innovation that improved the standards of living of billions of people to the current historically unprecedented levels, be careful injecting moralism here. @Chris C. I understand your concerns about injecting moralism into discussions of development. The current era of scientific understanding and democratic innovation had to start somewhere, but I’d rather live today’s world that is slowly converging than the divergence of the 1500. Our technological and social advances obviously owe a great debt to the (mostly) culturally European innovators of the last 500 years, but the world’s better off that these advances are increasingly shared. When it comes to a replacement, I’m wary of introducing one. Ultimately I agree that broad classifications that seek to neatly split the world into two categories are generally more harmful than helpful to our understanding of the world. I’d just advocate striving to stay away from simplifications and avoid terms that lump hugely disparate countries into neat groups. I am considering doing a new post talking about how unhelpful these kind of generalizations are and the value of trying to avoid them. Do I have you permission to quote your comment?